I began shooting drop and splash shots three years ago. 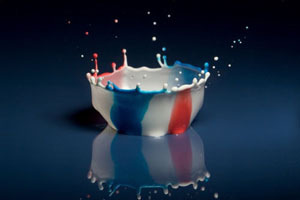 I was the amateur photographer wanting to recreate intriguing high-speed shots we have all seen. It seemed complicated enough to be a challenge, but within reach. As I achieved some competence, a few new challenges would diabolically arrive to egg me on. I have now taken 20,000 pictures of drops. I still have new things to try and challenges luring me. I use a digital SLR (Canon 20D), a 180mm macro lens, Vivitar flashes, and a homemade electronic timing/control circuit. The immediate feedback of digital has made it possible for me to learn quickly from my plentiful mistakes. The 180mm lens provides the working distance, excellent optics, and magnification I need. I modified the flashes so I can manually adjust the duration of the burst of light. Much of my custom timing/control circuitry could now be replaced with off-the-shelf components. I started with milk. It is the classic subject, and for good reasons. It is almost opaque, so it reflects light, but its slight translucence provides an organic feel. 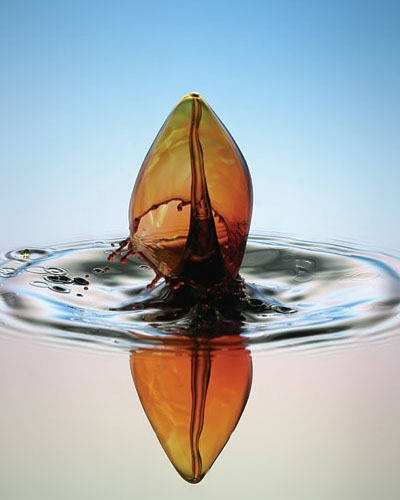 And, its gentle viscosity creates pleasing forms. Water is more difficult. Light is the currency of macro photography; it buys us time and depth of field. The brief flash required to stop the motion does not provide much light. Water is transparent, so it doesn’t reflect much light. Often, when I’m shooting water splashes, my main light is a backlight with a gelled flash. Since the camera is looking straight at the reflection of the flash, I get the light I need. Choosing appropriate gels creates a variety of backgrounds. When people smash light bulbs and pop balloons they use a sound trigger to fire the flash. Capturing flying bullets and splashing drops typically requires a photo-sensor that recognizes when a beam of light is interrupted. In either case, once the trigger is tripped, a timing device delays and then fires the flash. My timing/control circuit controls the timing of the drop release as well as the flash firing, so there is no sensor involved. More challenging than controlling flashes and digital cameras, and less well documented, is handling liquids. 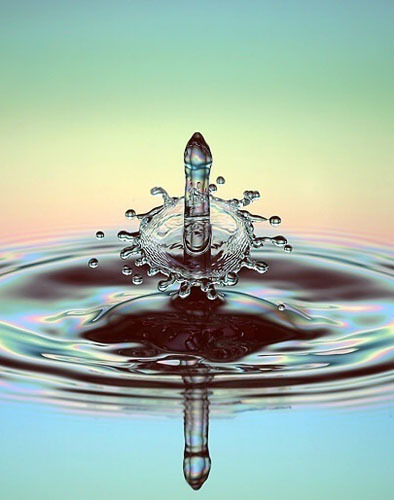 Not being electronic or mechanical, a fluid is nonlinear – a small difference in conditions can make a big difference in behavior. It is both beautiful and frustrating. 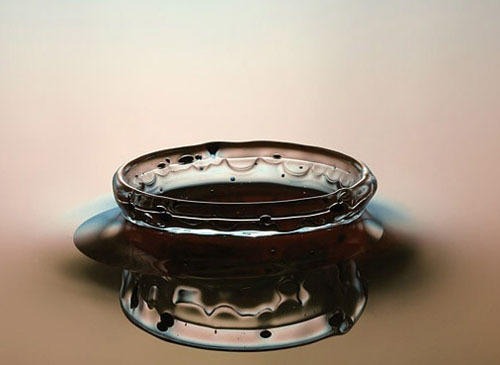 The parameters I have learned to control are timing, position, size, speed, color, viscosity, and surface tension of the drops. I add plain food coloring to color them. I use glycerin to vary viscosity and dishwasher rinse-aid to adjust surface tension. For most of my images, I know the shape I want before taking the picture. Through experimentation and experience, I have learned many of the possible shapes (or at least, ones that should be possible). My control is not perfect, of course, so it may take me 10 or 20 or 50 tries to get just what I was looking for (or close enough). All of the best-laid plans notwithstanding, serendipity and chance are my constant companions. I use Photoshop to crop, clean up the background a bit, remove a few extraneous droplets, and adjust the color balance, but I stop well short of manipulating the shape or placement of the drops. 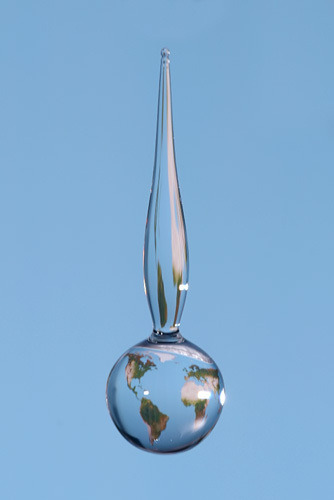 High-speed photography of drops and splashes has captivated viewers for a century. 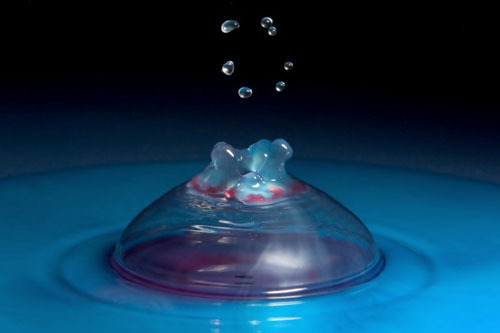 Fluids in motion have a simple beauty in their complex dynamics. Images of that motion stopped seem to tap into people’s innate child-like sense of wonder, engaging their imagination. I, for one, cannot seem to get enough of it. Harold “Doc” Edgerton is the father of the xenon flash tube and high-speed photography. Search for his books on Amazon.com. Andrew Davidhazy, at the Rochester Institute of Technology, www.rit.edu/~andpph, has good information on high-speed techniques, as well as other fascinating types of photography. www.hiviz.com has techniques, equipment diagrams, and kits. Equipment for can be purchased from www.bmumford.com and www.woodselec.com.